I was waiting for my train and dreaming of pancakes. 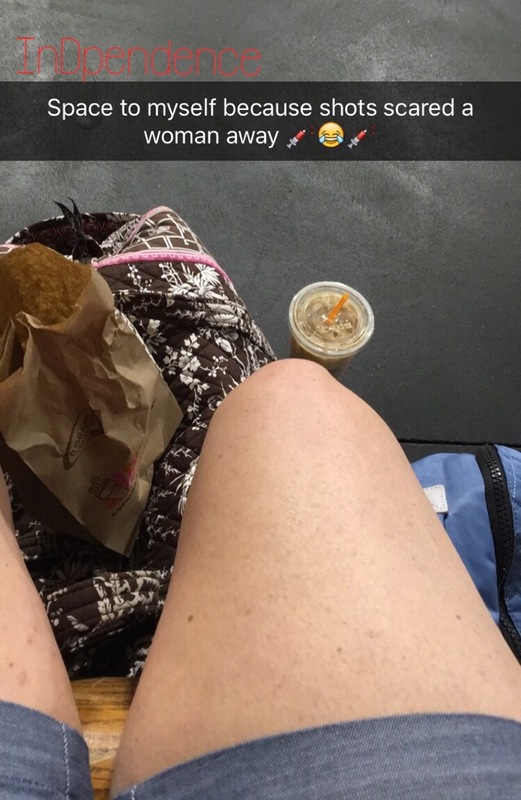 I was eager to get to my destination and needing insulin for my coffee and muffin. I should’ve eaten before I left the house, but I didn’t have any breakfast food in the apartment. I needed my insulin, but didn’t know when my train would start loading and didn’t feel like figuring out where the bathroom was with all of my stuff. I looked to both sides and the man on my left was in clothes with a layer of dirt radiating from them. I looked to my right and there was a woman in a perfectly planned Wimbledon outfit with accessories to match. I needed to figure out who would react less to my taking my insulin. I chose the right side. As I took out the Humalog pen, I noticed the side eye I was being given. I was ready to say I was taking medicine for type 1 diabetes. I just hadn’t decided if I would say I’ve had it for 26 or 27 years yet since my anniversary was still two days away. I figured out how much I was going to eat, and guesstimated how much Humalog I would need for it. I primed my needle and got ready to take my shot. Wimbledon lady was big eyed by this point and staring at me. I hiked my shorts up just a bit to find the best part of my leg. She jumped up and to the other side of her bags. She stood there staring at me for quite a while. As I was done she walked away, but never too far away. After all, she needed to keep tabs on the suspicious lady taking a shot in the train station! I sent this picture to a bunch of people because I found it absolutely hysterical. Some laughed along with me, some were confused and some were upset. I loved all of these reactions because they all come from the mind set that taking a shot of insulin is just like taking a sip of water. I love this so much. Side eye. I have also gotten a few of these. Once i signed and said oh it feels good to get aired up. I love creating double takes.